Victoria’s largest alpine resort, Falls Creek, has enlisted APN Outdoor’s digital formats in their innovative new winter campaign. The clever creative taps into Melbourne’s fascination with the weather and brings Falls Creek to life via snow and weather updates in rail and roadside environments in the city. 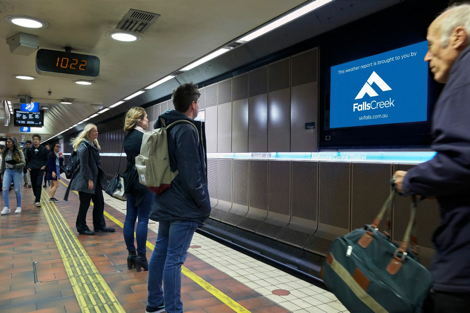 The two-fold campaign utilises Elite Screens on some of Melbourne’s busiest roads and XtrackTV in the city loop to entice commuters with a taste of what’s on offer at Falls Creek, just a few hours’ drive away. The high quality LED and directional sound capabilities of APN Outdoor’s XtrackTV have been skillfully utilised, displaying the snow report across the CBD network. Supporting the rail component is a series of weather-sensitive Elite Screens that use an RSS feed and a bespoke temperature trigger that updates the creative and brings the weather from the ski fields to passers-by. 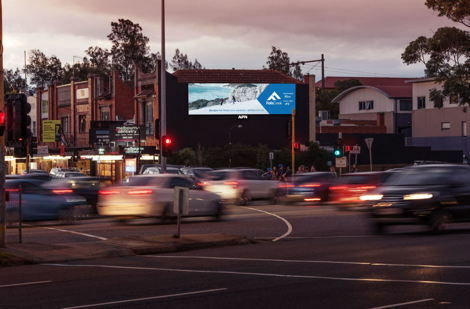 Falls Creek’s Senior Marketing Manager, Sophie Webber told us “We are extremely excited to partner with APN Outdoor on the innovative ‘Escape the Melbourne Weather’ campaign. Falls Creek at its heart is all about celebrating alpine life with friends and family in a unique ski-in ski-out resort. By connecting with families, ski and snowboard enthusiasts and those who want to explore the best of Falls Creek, we’re confident the campaign will deepen their connections with the snow and inspire them with a winter getaway”. APN Outdoor’s General Manager of Sales, Mark Fairhurst echoed Sophie’s was quoted as saying “We are thrilled that Falls Creek has chosen our impressive digital portfolio to execute this clever campaign. We know XtrackTV has the potential to deliver the right message at a time when commuters are most receptive. Location and relevance to the consumer are boosting the impact of successful messaging”. APN Outdoor is Australia and New Zealand’s most progressive Outdoor advertising company; leaders in the Digital Billboard, Billboard, Transit, Rail and Airport advertising categories. Whilst dominating traditional outdoor formats, the company also maintains particular focus on growing and developing their digital portfolio, establishing APN Outdoor as the unrivalled leaders in this space. In addition, APN Outdoor have established themselves as vanguards in research, investing in several market leading studies, that prove the power of the medium and foster innovation and growth throughout the sector. APN Outdoor boast over 36,000 high-impact, attention-grabbing locations, dominating major city skylines, roadways, rail-stations and airports across both sides of the Tasman. This entry was posted on Thursday, August 3rd, 2017 at 15:08 @672 and is filed under DailyDOOH Update. You can follow any responses to this entry through the RSS 2.0 feed. You can leave a response, or trackback from your own site.